Pure Pressed Mineral Foundation provides oil-free, natural looking coverage, minimises the appearance of pores and fine lines while creating a luminous natural matte finish. Pure Pressed Mineral Foundation provides oil-free, natural looking coverage. Mica Beauty's Pressed Mineral Foundation provides excellent coverage. The long lasting formula minimises the appearance of pores and fine lines while creating a luminous natural matte finish. The antioxidants help calm your skin and defend them against future damage. 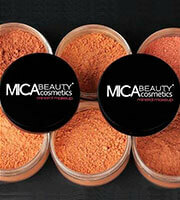 Mica Beauty's Pressed Mineral Foundation is talc-free, paraben-free, fragrance-free, oil-free and non-comedogenic. For a flawless application, start with our Perfecting Makeup Primer before applying our Mineral Foundation using our Kabuki Brush. Finish with your favourite setting spray for a look that will take you from a day at work to a night with friends. Love this as it is not as messy as the powder foundation but the finish is still as amazing as the powder foundation. Amazing foundation! Stays on all day, and matches my skin tone well! Would purchase it again. 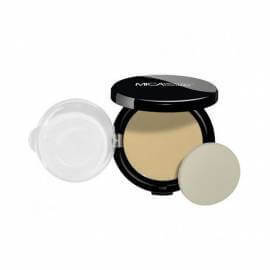 The pressed Foundation is the other great alternative from the Mineral Foundation Powder, if you do not like the mess from the powder, get the pressed mineral foundation. It works exactly the same as the mineral foundation powder. I bring this product with me everywhere cause the packaging is compact and it doesn't get messy when I apply it everywhere. Great Foundation!! Light weight with good coverage!